People have problems; that's just a fact of life. Most people also work for a living, and sooner or later, the two are going to collide. When a personal problem does land on your doorstep, the last thing you want to do is bring it with you to work. That can cause all sorts of additional issues, and they can compound your personal issues even more. So what do you do? How do you separate personal problems from the daily grind? It may seem like the most obvious piece of advice, but it is the one most commonly ignored. All too often this is the way it goes: A trusted friend tries to help you out by telling a manager why you may be off your game. From there, it becomes an issue that several people know about. And before long, half the people in the company are aware of it. It doesn't matter who you think you can trust, and what kind of confidence you swear them to, it will leak. Loose lips sink ships … and careers. It's imperative to get emotional support at this time, and that means talking to someone completely removed from your work environment. Avoid anyone who doesn't work at your firm, but knows a lot of people that do. This can mean going to support groups, using online forums (where you can remain anonymous but get advice), or if worst comes to worst, calling a crisis hotline such as Samaritans. Don't be afraid to ask for help, because a problem shared really is a weight lifted. Just make sure you do it in a way that cannot create another problem — namely, a career problem — on top of whatever else is troubling you. Not talking about your problem at work can be tough, especially when people treat you poorly without knowing what you're actually going through. So, look into helpful and productive ways to deal with the emotions that can build up in the workplace. One of the best ways to hash out emotional stress is going to the gym, especially if your office provides a workout facility on-site. Otherwise, going to the gym before and/or after work, or exercising at home, can do wonders for your emotional pressure cooker. If working out doesn't do it, find a new hobby, or really go all in on projects at work to keep yourself from thinking about your stress. You don't have to breathe a word about the specific problem you're facing. 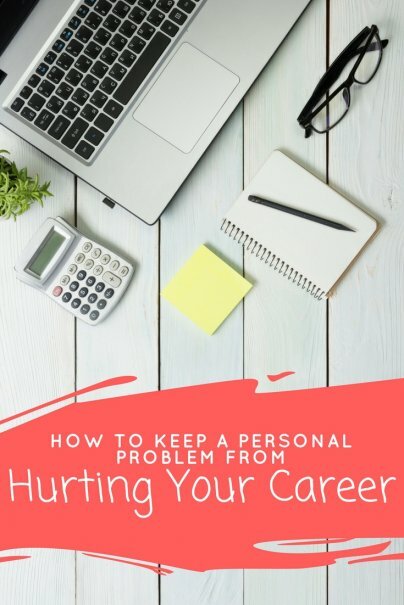 You can simply say something like, "I'm going through a problem that's important and stressful outside of work, and need your help in managing my workload and the expectations of other departments." Your boss knows you're not a robot, and if you have been a superb employee before the problem arose, he or she will do whatever possible to help you ride out the storm. You may be given the option to telecommute, or have some of the responsibilities lifted from you for a while. Just remember, a company and a boss can only do so much. If this drags on for months or more, the patience of those you work with will wear thin. If the problem is so intense that you just find it impossible to concentrate on your work, look into taking some much-needed time off. You will definitely be able to use vacation and personal days. It's possible you could also use sick time, or bring the Family and Medical Leave Act (FMLA) to your defense. This U.S. labor law requires employers to give workers job-protected unpaid leave in the event of a qualified medical or family emergency. While you may think it will look bad to take extended time off, it will be far worse to stay at work and put in a terrible performance. In some cases, your lack of concentration could lead to disastrous consequences. Better to be away and working things out than at work and messing things up. Thankfully, the stigma of seeing a licensed psychologist or psychiatrist lessens with each passing year. However, there are still people out there that avoid them at all costs out of embarrassment. Really, that should be the last concern on your mind. You need to solve the personal problem that's weighing you down, and professional counseling can be a great help at this time. The counselor may not be able to solve that problem directly, but even just talking it through with them can open new possibilities and avenues of success. At the very least, it's a confidential source in which you can confide, and that in itself can be a huge help. When you get up in the morning, along with your usual routine, add something that gets you ready to tackle the workday — both emotionally and physically. Tell yourself that this will pass. Remind yourself that you're a good person in a bad spot, and bringing that issue to work will not help your situation. Take a deep breath and say out loud, "I'm going to do a great job today, because I'm a great employee." It may feel corny, but doing it every day before work gets you into the mindset of being a real pro. The power of positive thinking is proven, and by getting into the best state of mind and avoiding negative thoughts, you will do much better at work. As the brilliant work coach Tim Ferriss says, "If you sit down in a negative state, you will be thinking first and foremost of problems, and not solutions."